The all-new Billcon D-551 features advanced high-speed denomination recognition technology, six modes of counting bills preset batching and a blazing 1,200-notes-per-minute speed. Billcon's unique full-line sensor accurately distinguishes between the six denominations of U.S.bills . Magnetic sensors provide quick and effective suspicious note detection as counterfeit. The large, easy-to-read LCD screen shows total bill count and value, total cumulative bill count and value, bill count and value by denomination, cumulative bill count and value by denomination, as well as error codes and messages. When the Billcon D-551 encounters errors such as skew, half note, short note, over-batch, jams, etc., it automatically notifies the user with an alarm and LCD readout. The D-551 is programmed to start automatically when bills are placed in the hopper. Or, it can be set to start manually..
Two communication ports for RS-232C can be installed for connection to devices such as personal computer, serial printer and cash settlement system. Identifies and counts mixed denomination bills, providing a summary of each denomination and total count. Sorts a specific denomination. Other denominations are rejected to the pocket. Counts a specific denomination. 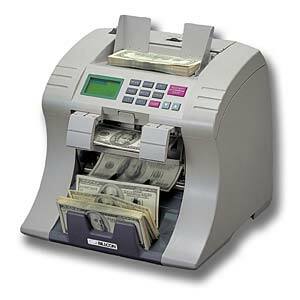 When a bill of a different denomination is detected, the machine temporarily stops. When bills are removed from the stacker, counting resumes. Sorts in direction and denominations. Other direction and denomination are rejected to the pocket.